Within MINTclass you can now add a new additional module which will allow teachers to make notes, plan meetings, share notes with other teachers and much more. 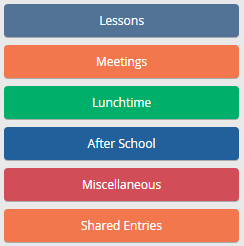 You can make notes on Lessons, Meetings, Lunchtime and after school activities and much more. To access the new Teacher Planner all you need to do is log into MINTclass and click on TeacherPlanner at the top of the screen. 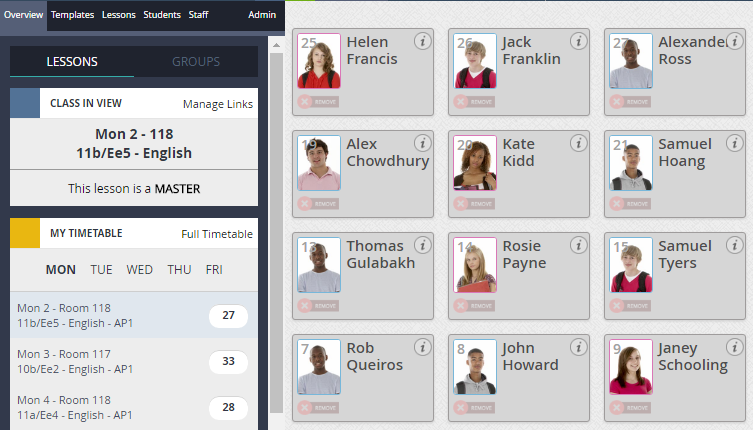 You will now see that MINTclass has populated the planner with your lessons from your timetable. In the top left-hand corner of the screen, you can see a calendar allowing you to jump to any day you want to. Simply scroll through to the correct month and then click on the appropriate date. Simply click on the one you want and MINTclass will jump to it for you. Click on the lesson you wish to make a note for and type the note. As you type, you will notice that the box has an orange border and when you finish typing you will notice that the border changes to grey, this indicates that the text has been saved successfully. This is also reflected by the green tag to the right of the box. Once you have started to write notes and may have written multiple for one lesson, you can see the history of the note by clicking on the tick. You will see timestamps for each note. You can save to overwrite any current notes in there with the version in the timetstamps. You can now share this note or move it to the next time you see the class. This is useful if you have made yourself a note about something you need to do next lesson. To access these facilities, you will need to click on the grey tab in the bottom right-hand corner of the box. You will notice that you have a number of new options. If you wish to share the note, click on the share button and you will see a pop-up like the one below. You can now choose the member of staff that you wish to share the note with. It could be another teacher that you share the class with or the Head of Department for example. Just click on the drop down box, locate their name and then click on Share. Shared notes appear at the bottom of the screen and you can jump to them by clicking on the Shared Entries button on the sidebar. From time to time you may need to search the Teacher Planner for a note you have made or a meeting you have coming up etc. Click in the Search box at the top of the screen. Type what you need to search for, for example, "Group" then press enter to search. MINTclass will then display all notes with the searched word in and highlight them in orange for you. Sometimes you have added notes for a lesson that you didn’t get around to doing or the lesson cancelled etc. By clicking on the Move to Next Time button you can move your notes to the next lesson with that group. Once you have selected to move the notes you will see a note in the original lesson confirming which lesson the notes have been moved to and the notes will then appear in that new lesson. We all have things that we have to do weekly, half termly etc so we have added the functionality that enables you to add an event once and repeat as many times as you need. At the bottom of the screen, you will find a My Entries area. To add a new event, click on the Add New Entry Type button. You now just need to name the event and then choose how often it recurs. You may notice that MINTclass knows what day and date you are on and offers you the choice to repeat on a certain date every month as well as the standard options. 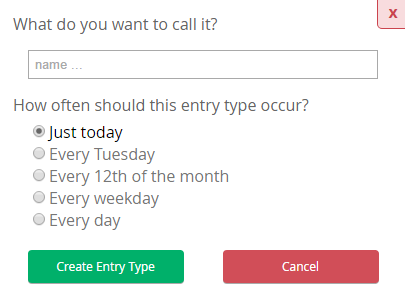 Once you have selected your recurring option click on Create Entry Type. Your event will then be created and visible at the bottom of the screen. You may need to delete previously created recurring events from time to time. To do this you will need to locate the event you wish to delete then, click on the grey tag in the bottom right-hand corner. Now click on Remove Entry. Select the appropriate action and click OK. This will remove the selected events from your planner. If you have kept some events, say previous to today, they will remain if you selected to keep them. If you then decide to delete those as well when you click on the Remove Entry button you will see a different pop-up. So you can see that selecting the correct option in the first instance is important because if you wish to remove all of them from your planner but only select to remove future events you will need to go back and delete the others one at a time. Within the Teacher Planner, you can also jump to the seating plan for that lesson. Simply find the lesson in the Teacher Planner and click on the Go To Lesson button found on the left-hand side of the lesson. MINTclass will open the Seatplanner in a new window and display the selected lesson allowing you to view the plan and make notes. We have updated Teacher Planner to include links to documents. Type the document path or URL and click on save (you can also copy and paste this). You will now see the link in your planner and as before you can share the note and now the link with other members of staff such as cover supervisors or the cover manager. 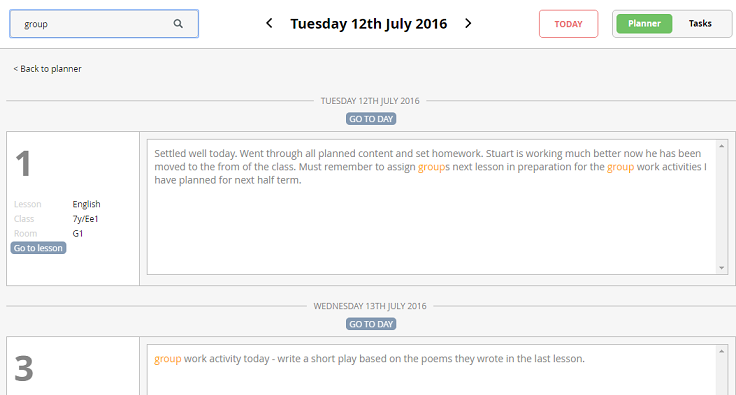 As well as adding lesson and meeting notes you can also set tasks in the Teacher Planner. The tasks button is located in the top right-hand corner of that screen. Click on Tasks to switch between the Planner area and the Tasks area. Here you can add new tasks to different areas of the planner as well as see any previous tasks and completed tasks. Click on the Add Task button to the right of the area you wish to add a task to. Type your task into the new text box then click on Save. You can edit the task by clicking on the pencil icon to the right. Don’t forget to save your changes. Once a task has been completed click on the tick icon to the right and the task will jump to the completed section at the bottom of the screen so you will never lose a task.